Welcome to Age of Conan: Unchained! Your best resources: A sharp blade, a sharper wit, and this comprehensive guide! Read over the guide as you begin your adventure in Hyboria, and arm yourself with the knowledge you’ll need to conquer your foes. 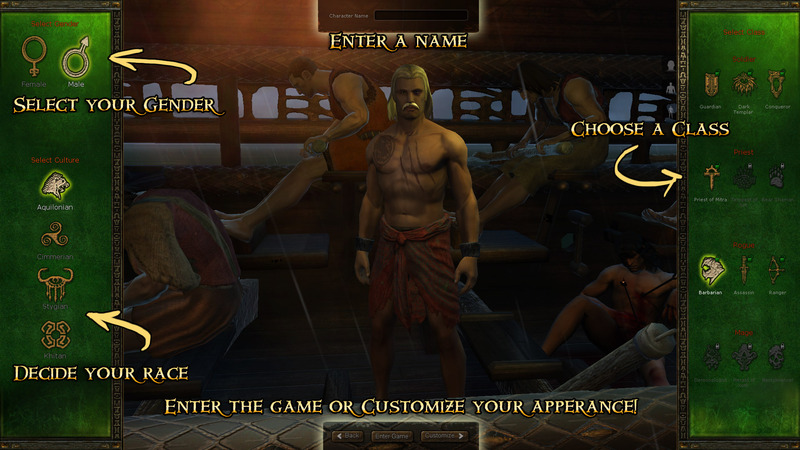 In order to play Age of Conan: Unchained, you need to have or create a game account with Funcom. A game account is your personal identification for the game servers. Follow the on-screen instructions to work through the process. Make sure you write down your username and password, as you will need these details when logging in. 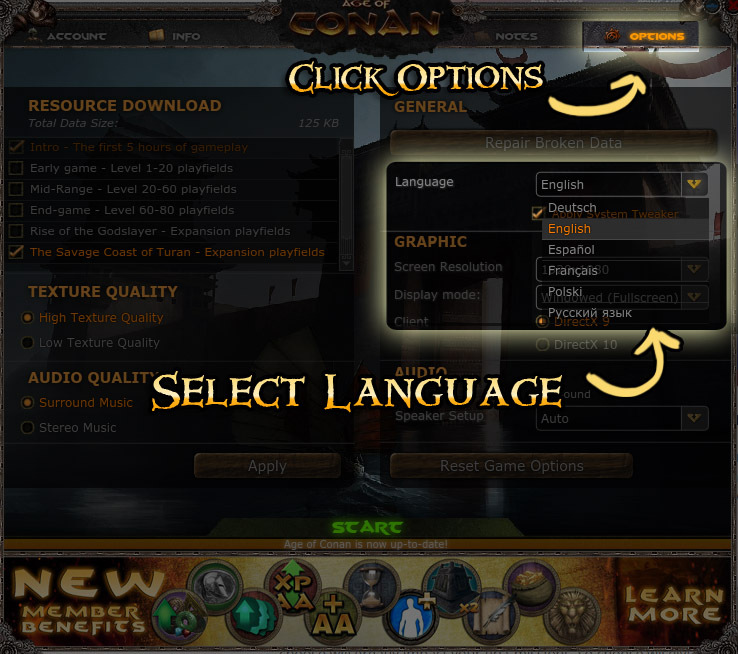 If you already have a Funcom account, but have not yet played Age of Conan, please log into your account homepage and then click on “Add a Game” from the menu on the left. Choose Age of Conan, and then choose a login name & password. To avoid confusion, we suggest using the same information you use for other Funcom titles. After you’ve installed the game and created a Funcom game account, run the game by double-clicking the Age of Conan icon on your desktop, or access it via the Windows start menu. When you first launch Age of Conan: Unchained, the first thing you see after starting the game is the launcher window. This allows your Age of Conan: Unchained game to be automatically updated when updates are available. You may select your in-game language by clicking on the Options section from the top-right of your launcher window. This will open a new screen that lets you choose from a number of options, including the Language on the right side. Each option will localize most text in the game to the selected language. When selecting a new language, you will need to restart the launcher. When your game is updated and you’ve selected your desired language, simply press the green “START” button! Getting started is easy! Simply enter your username and password to log in. 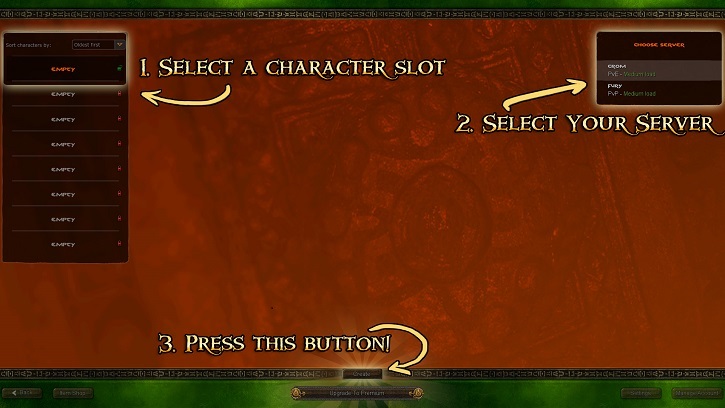 You’ll be greeted by a character selection screen--this is where you start your adventure! • CROM: Player-versus-environment (PvE) - This server focuses largely on players fighting against computer-controlled monsters and characters, with PvP limited to areas set aside expressly for that purpose. • FURY: Player-versus-player (PvP) - A server with a looser restrictions to player-versus-player combat. This server has rules that promote more widespread PvP, encouraging players to fight against each other. This may offer more challenges and may not be suitable for new players. If you are planning to play with your friends, ask them what server they are on, or plan to be on! You can only interact with players who are on the same server you have selected. THE AQUILONIANS - Aquilonian fighters are disciplined and tough, often more soldier than warrior. These people value martial skill, and admire any who stand against the nation’s many enemies, especially the vile Picts. Aquilonians cannot be the Mage archetype. THE CIMMERIANS - Cimmerians are a barbarous people, living hand-to mouth-in a hostile realm. It earns them some pity from other nations, but grants them a resilience no training can teach. The Cimmerians believe that Crom gave them strength at birth— the strength needed to meet the trials of life. Cimmerians cannot be the Mage archetype. THE STYGIANS - Stygians, as a people, favor cunning, intelligence, and agility over brute strength. Stygia is famous for producing powerful priests and sorcerers--after all, swords and axes are the hallmarks of a barbarian; not a civilized person. Stygians cannot be the Soldier archetype. THE KHITAN - The Khitan are slender with sharp features, and as a people, openly embrace sorcery and practice of the dark arts. Khitan culture is insular, and they have little interest in conquering other lands nor embracing barbarism of their neighbors. Khitan can choose from many classes across all archetypes. Playing as a Khitan requires the “Rise of the Godslayer” expansion set, sold separately. After you choose your character’s race, the available class choices for that race will be shown. Age of Conan: Unchained features twelve distinct character classes, each determining your abilities in combat, what types of equipment you can use, and what feats your character can acquire when leveling up. Classes are divided into four archetypes: the Soldier, the Priest, the Rogue, and the Mage. Guardian: The sturdiest of all the soldiers, their strength lies in their ability to mitigate damage with their heavy armor and shield. Foregoing sorcery in favor of pure physical prowess, Guardians are adept with sword and shield or wielding polearms capable of sweeping through ranks of enemies. Dark Templar: Fusing heavy armor and martial skill with dark magic, The Dark Templar can leech the life force of their enemies, conjure protective wards, and unleash occult energies against enemies around them. Conqueror: Conquerors are soldiers with the ability to augment their allies with battle-cries and inspirational auras, as well as causing disarray and decreasing the power of their foes. They wield formidable two-handed weapons and can dual-wield for even more offensive power. Priest of Mitra: Renowned healers, Priests’ abilities to augment allies, heal wounds, and impair enemies make them indispensable to any party exploring Hyboria. Priests of Mitra possess some of the strongest healing and support spells in the game. Tempest of Set: These followers of Set are feared for the obliteration and ruin that follows in their wake, but like other priests, they have the power to heal en masse and restore life. Tempests of Set wear light armor and strike a balance of offensive magic and crowd-control effects with healing and support spells. Bear Shaman: A well-rounded union of healing powers, medium armor, and mastery of two-handed weapons, Bear Shamans are sturdy melee combatants. Capable of mighty combos with a complement of druidic enchantments, they make fearsome enemies in combat. Barbarian: Armed with either two-handed or dual-wielded melee weapons, Barbarians are brutal warriors that favor overwhelming their opponents before they can retaliate. Only able to wear light armor, Barbarians rely on knockdowns, area-of-effect attacks, and incredible damage output for survival. Assassin: Wielding twin daggers with lightning speed, Assassins are masters of the shadows and corruption. With only cloth armor to protect them, Assassins tend towards debilitating their enemies with deadly poisons before moving in for the kill. Ranger: Masters of ranged combat, Rangers prefer to strike from afar with a dizzying array of damaging and controlling effects at their disposal. While able to equip medium armor and defend themselves with melee weapons, a Ranger’s true strength lies in their finesse with a bow. Demonologist: Donning cloth armor and concentrating solely on sorcery and the potency of their spells, Demonologists are an unmatched destructive force. Commanding the powers of flame and lightning, Demonologists rain massive magical damage upon their foes and can even summon a demonic familiar to aid them in combat. Herald of Xotli: An unholy marriage of spell and sword, the Herald of Xotli combines melee prowess with hellborne sorcery. Faithful servants of the demon-god Xotli, Heralds can transform into twisted abominations that provide considerable boosts to their damage output. Necromancer: The masters of black magic, the Necromancer animates the dead and corrupts the living. Capable of commanding a legion of undead minions and tapping into the cold of the Afterlife, Necromancers are adept at survival and controlling the battlefield while draining the life from their foes. Social buttons give access various Social windows, including Friends List, Guild Search, Massive PvP, Raid Finder, and more! There’s also a great in-game tutorial here, found at the yellow question-mark. Item Shop [ , ] - Browse and purchase items available for Funcom Points. Equipment & Inventory [ I ] - View and manage your inventory and equipment for your character. Skills and Attributes [ P ] - View your character’s statistics, attributes, experience, crafting skill levels, and more. Feats [ N ] - Opens a new window containing a vast list of options for your character’s advancement. The Alternate Advancement system is also available from this window, near the bottom. Quest Journal [ J ] - Opens a list of all quests you have active for your character. Achievements [ CTRL + L ] - Opens a window that lets you view all of the achievements available in the game, plus their rewards! Daily Login Rewards [ . ] - Opens the daily login rewards. You can get one reward per account every day, for free! Challenges [ Shift + C ] - Opens the challenge window. Meet the listed requirements and earn a free reward! The Quest tracker shows the quest objectives for quests you’ve chosen to track (from the Quest Journal). The mini-map appears in the top right corner of the screen. It shows your immediate surroundings. Use the controls next to the mini-map to zoom in and out. You can also access a bigger version of the map by pressing the Map key [ M ]. The shortcut bars at the bottom and sides of the game screen provides space where you can drag items and abilities onto for easy access. Press the SHIFT key and then 1 through 0 to access more shortcut bars. The side bars can switch between vertical and horizontal displays by right-clicking on them. Your health, stamina, and mana appear on the left of this area, and your target’s vitals are displayed on the right. In the middle are your attack directions; use attacks that correspond with your target’s weak side (see “Shields” below). Side attacks (Q, E) are unlocked for Melee characters and Rangers at Level 40. These are your active perks. Perks are trained through the Alternate Advancement panel, found from the Feats menu ( [ N ] ). As you gain experience, these XP Bars fill up. When the bar completely fills, you gain a level! The top bar, in yellow, is your character’s experience. The number displayed at the end of the bar are “Fresh Kills”, which grant extra XP when killing worthy monsters. You get 20 Fresh Kills every day. The bottom bar, in orange, is your character’s PvP experience. You gain PvP experience for defeating enemy players. All communication with other players is handled through the Chat Panel. You may switch between tabs to see other information, such as a combat log. Activate the Chat Panel by pressing the Enter key, type a message, and then press Enter again to send the message to its recipients. A combo attack is being executed in the main viewing area. Follow the directional attacks listed in the combo to unleash a devastating move! See “Combos & Spells” below for more information. At the top of the screen (just below 2), your character’s beneficial effects and their durations may be seen. From the main view, you can explore and interact with the vast world of Hyboria. Controls in Age of Conan are simple! Use the W, A, S and D keys to control your character’s movement. Hold Shift to make your character sprint. Sprinting consumes a separate energy bar. Press Space to jump. Tab will cycle between targets. Use the 1, 2, 3, Q, and E keys to execute directional attacks with melee weapons. Q and E are only available for Melee classes and Rangers after Level 40. Use the other number keys to access combos, spells, and abilities from your shortcut bar. Hold the Right Mouse Button and move your mouse to quickly turn the camera. Click on targets with the Left Mouse Button. Scroll the Mousewheel to zoom the camera in and out! Press ‘Esc’ or F10 to open the main menu. For a full list of keyboard shortcuts, you can open up the in-game menu with Esc or F10 and go to ‘Interface Options’. Your character can execute combo moves during combat, depending on the class you are playing. When activating a combo, an indicator will appear that shows you which directional attacks to perform in order. Completing a combo deals extra damage and causes additional effects! Remember, what combos you can use depends on the weapon you have equipped. Combos not available for your equipped weapon will be grayed out. If your character can master the awesome powers of Hyborian magic, acquired spells will also be listed in the “Combos, Spells & Special Abilities”. Spells are divided into different types, such as friendly spells and hostile spells. Remember to drag any ability you want to use—be it a combo move, a spell or any other ability—into your shortcut bar for easy access while you’re playing! There are a few ways to target an enemy. With default auto-targeting turned on, you can just run up to someone or something and start hitting it. You can also simply click on enemy targets, or press the TAB key to switch between targets. Please note that your attacks deal damage in a small area in front of you. You’ll always do more damage to your primary target, but you should be mindful of other nearby enemies! Age of Conan: Unchained featured a unique combat mechanic: Shielding. When entering combat with enemy NPCs, you will notice icons that appear to their sides and above their heads (see above image). The more of these markers you see stacked on one side, the less damage that enemy will take from that direction. Your enemy’s shields are marked with white icons, while your own are marked with yellow icons. Here’s how it works: • 0 Shield icons - You will do bonus damage. • 1 Shield icon - You will do normal damage. • 2 Shield icons - You will do less damage. • 3 Shield icons - You will do very little damage. Enemies will typically shift their defenses towards the side they are currently being attacked the most, so be sure to frequently switch up your angle of assault through positioning and different attacks! Quests are given out by NPCs. Talking to them is the best way to discover if they have a quest for you. Once you accept a quest from an NPC, it will be logged in your Quest Journal. • Night time—During night time, you are in a single-player environment and do not play with other players. This part of the game emphasizes storytelling and your experience alone in the world. • Daytime—During daytime, you are in a multiplayer environment. Here you can see other players, quest with them and communicate with them. This part of the game emphasizes group experiences. 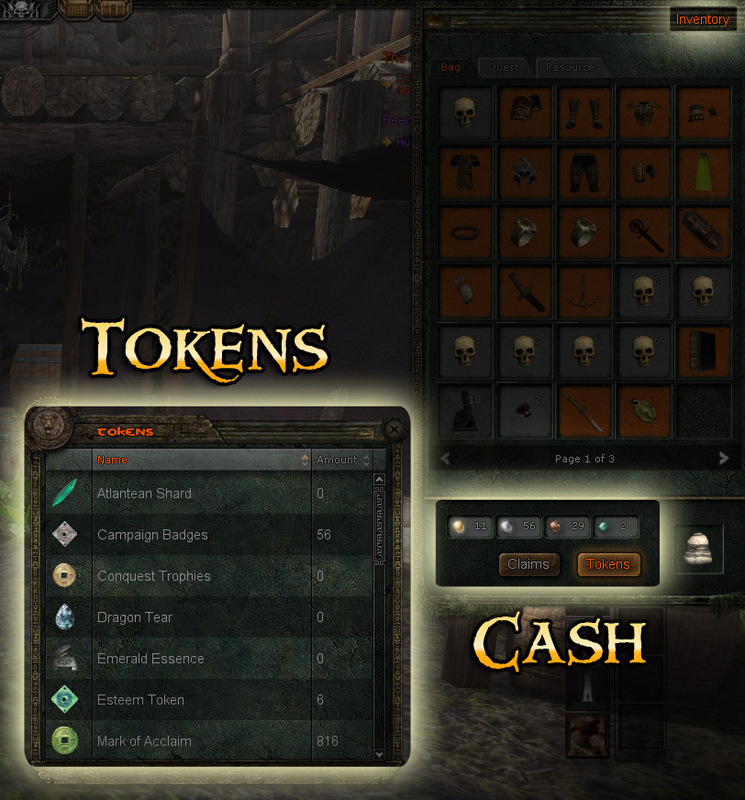 Tokens are another kind of currency in Age of Conan: Unchained. When starting out, you don’t have to worry about these, but as you continue your journey you’ll find various kinds of Tokens in addition to loot and gold. Many powerful items will require a combination of tokens and gold in order to purchase. Cash and Tokens may be viewed from your inventory screen. 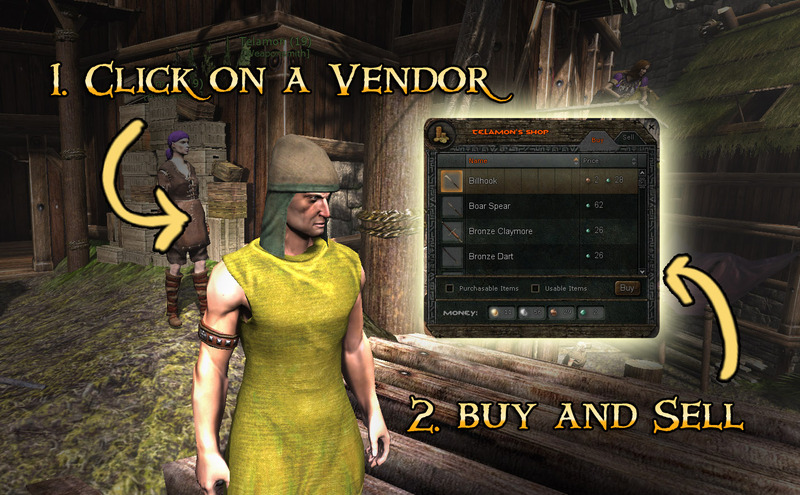 You will also come across NPC vendors that offer various items and services in exchange for gold or tokens. Every vendor in the game have the options to either buy from them, or sell your own items to them for cash. If you ever accidentally sell something to a vendor, you can always undo the sale with the “Undo” button under the ‘Sell’ tab..
Additionally, you will find Traders in most cities and outposts. 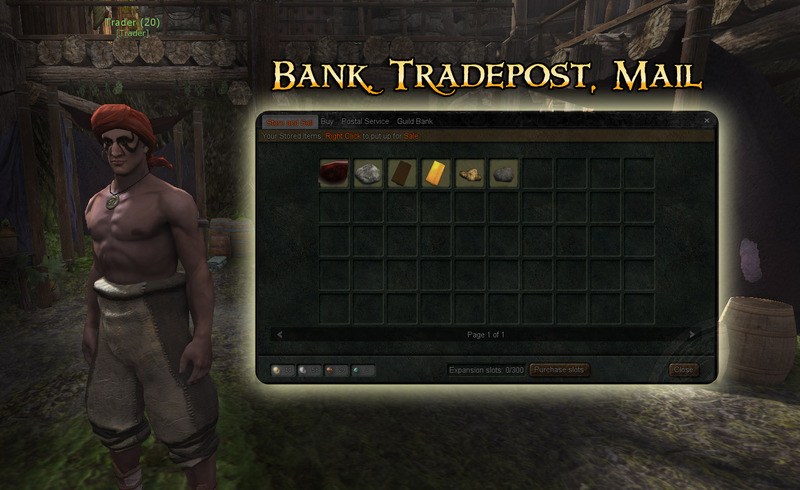 Traders are an important resource, as they serve as your personal storage, auction house, and mail service. Here, you can store items that you don’t want to keep on your character, but don’t want to throw away. Storage is global, so you don’t need to return to the same Trader that you initially stored your items with. 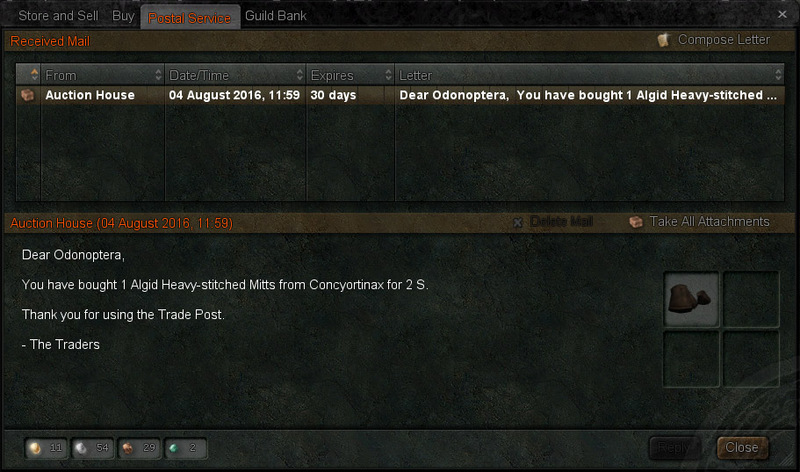 When an item is in your storage, right-clicking on the item gives you the option to sell it on the Tradepost. The “Buy” tab takes you the Auction House window that allows you to search from various item types and narrow down your search for the item you want. Everything seen from this window was put up for sale by another player on your server! The “Postal Service” tab brings you to a window where you can read or send mail. Anything you buy or sell from the Auction House will appear in your mail--including items and cash. You may also send and receive mail to and from players on your server, and include items or cash along with a personalized message to anybody you wish. 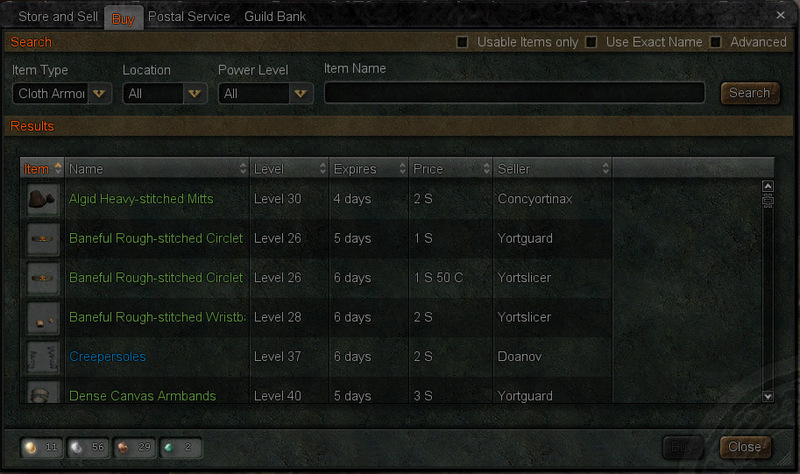 Finally, the Trader also servers as a bank for your Guild, if you are in one! Make some friends and gather your riches! Sooner or later you will find yourself on the losing side of a battle, and the clutches of death will grasp at your throat. Luckily, death in Age of Conan: Unchained is not permanent. You can dust yourself off and try again, but keep in mind that certain penalties are involved when dying. These penalties impact you as a negative effect, which appears as a skull symbol over your character’s vital stats on-screen. Resurrection spots - When you discover a new area of the game world, you will come across resurrection spots. As you discover these, your character will remember them. When you die, you get to choose where you want to resurrect in that region of the world. Headstones - To remedy the negative effect placed on you when you die, you can go back to the place where you died and interact with the headstone there. When you die, try to resurrect at a location close to where you died. This way, you don’t have to travel far before you return to the action. The distance between you and the resurrection spot is shown in the Resurrection window. © 2012-2016 Funcom. All rights reserved. © 2012 Conan Properties International LLC ("CPI"). CONAN, CONAN THE BARBARIAN, HYBORIA, and/or ROBERT E. HOWARD and related logos, characters, names, and distinctive likenesses thereof are trademarks or registered trademarks of CPI and/or Robert E. Howard Properties Inc. unless otherwise noted. All Rights Reserved. Funcom authorized user. Funcom is headquartered at Funcom Oslo A/S Bestumstubben 11, N-0281 Oslo, Norway.